Rated 5 out of 5 by Kay_Erin from What a fun and surprising game! This is absolutely Elephant Games at it's best. I've always loved the Mystery Tracker Series, and it seems they have got a second wind. Great story line which was on target throughout the game. For those who don't care for pet assistants (I like 'em:) you can choose to work without Elf, the little chihuahua sidekick. 'Course then you will miss out on collecting cute outfits for him. ...which depending on your view can be good or bad;) The voice overs were excellent, although I did get a little tired of our young scientist's high voice, but still, consistent with the character. The HOS were good, even mixing it up a bit and looking for morphing objects occasionally. As noted by a few sharp observers, there ARE re-playable HOS and puzzles, 'tho I don't usually do them. In the case of Elephant Games I always replay,and don't want to solve the puzzles to easily:) I rarely do this, but I'm going to recommend purchasing the CE version of this game as you learn more about the new adversaries (see above) and it rounds off the game nicely. Rated 5 out of 5 by pgillenw from Dang good play! Had a great time playing this game. Great to see Elf again just love that little critter. Well done! 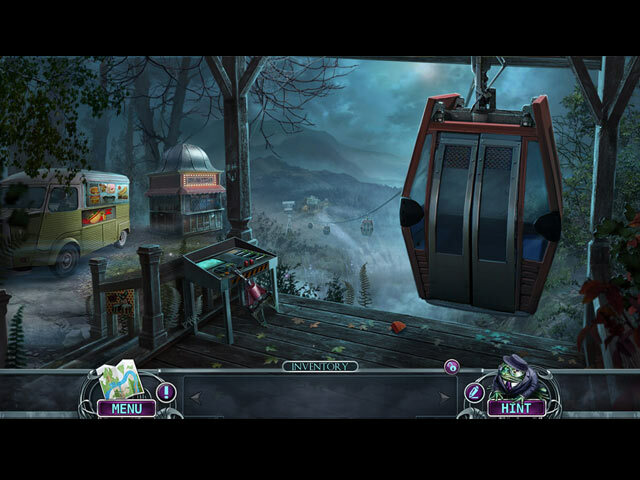 Rated 5 out of 5 by Majestyx12 from The Secret Room has replabable hops and mini-games Yes it was a bit short. Loved Elf, didn't like to see him dressed up in the Elves. Liked collecting the picture fragments to make 4 jigsaws in a album. Loved the 24 morphing objects. In the secret room it has replayable 16 hops and 13 mini-games. I felt bad for the snow covered kitty out in the snow. Loved the Elephant Topiary. The bonus chapter had a surprise in the story and I wonder if the next MT will run with it. When you collect a paper Elf, he is placed in a room all dresses for a occupation. There is some movement with them. I guess if your into dressing your pet you may like this. I had a place where it froze up. I had to stop and restart. Try for yourself. Rated 5 out of 5 by sunnyglow from A ROLLER COASTER RIDE THROUGH TIME AND PARALLEL UNIVERSES REVIEW BASED UPON ENTIRE GAME 3 Chapters Plus a Bonus Chapter – Strategy Guide: 37 Pages - Time: 4 hours. OVERVIEW: OVERVIEW: Detective! Climb aboard an interdimensional roller coaster as you spiral between time and space and enter parallel universes! Out of the fog and into your life comes monsters! Yes, nasty, red-eyed interdimensional nasties are invading the small town of Blackhill! You and Elf are off to a small town to tackle these denizens of the fog. Working on project involving the space/time continuum, Professor Xiao and his genius niece, Sophie, opened a portal into a parallel universe. When Sophie, the professor’s niece, is kidnapped, you, with Elf at your side, are off to save her and investigate this case. QUALITY OR QUANTITY? Quality! What else can I say – Elephant is one of those champagne developers whose games I truly enjoy. I love the story which revolves around the string theory of quantum mechanics and parallel worlds. This is another great entry into this series! This game should appeal to all the Elf lovers out there! The graphics are decent. The pace is excellent with plenty of activities to keep you occupied traveling through time and space. THE POLAR OPPOSITE! Quantity! What a disappointment! This game very short. I finished it in less than four (4) hours including the bonus chapter. It appears that with each game produced, they are becoming shorter and shorter not just for this developer but others as well. Also, I also wish there was an option to replay some of those puzzles. I found a few difficult and would like to play them again. You cannot replay any HOP scenes either. QUANTUM MECHANICS: This game is short on extras! You collect twenty-six (26) picture fragments to complete photos at the end of the game. You also collect twelve (12) figurines of Elf attired in different costumes. This is a nice whimsical addition to the game. Although not a dog person, I felt they were adorable. There are twenty-four (24) morphing objects. I found all somewhat easy to locate. I counted twenty-one (21) achievements to earn. TO ELF OR NOT TO ELF: I have only purchased a few of these games due to Elf. There are some of us who are not dog lovers or do not want helpers in the games. However, you do have the option to forgo his help. He will frown and go away dejected – but - will not be seen throughout the main game. However, why didn’t this developer offer this in the bonus chapter? You cannot opt out of using him and he is used quite a bit in this chapter. BONUS CHAPTER: It is related to the main game with the same characters from that game. In the bonus chapter you must save Professor Xiao and Sophie from an evil organization from an alternate universe. When the professor is kidnapped you will be zipping back and forth through time in alternate realities. Like the game, I did not feel it was long enough to be worth the additional price of the game. HOP SCENES: There are twenty-three (23) HOP scenes in the game – five (5) of those in the bonus chapter. This also includes several mini-HOP scenes which require searching for a small number of one item. They are varied as well. However, I felt the ones in the demo were better created than the ones after the demo. They include the usual lists of items, silhouette, matching and storybook scenes. However, there were two I felt were rather creative. 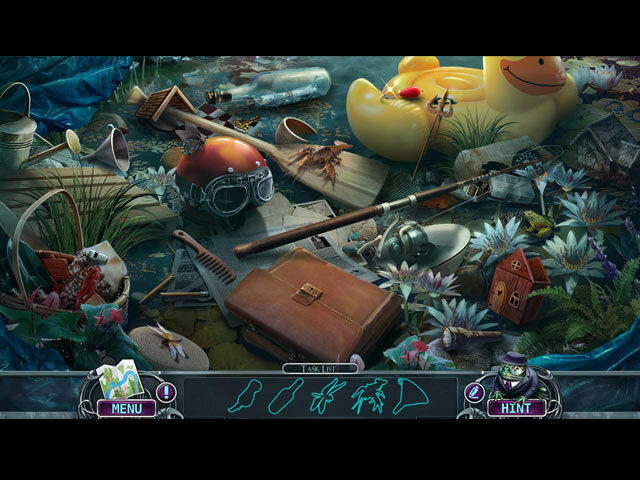 There is one which is a rebus scene in the demo and in the main game there is one which has looking for patterns or pieces of the scene instead of actual items. There are also several scenes in which you search for four (4) morphing objects after locating items within the scenes. PUZZLES: There are thirty-three (33) puzzles within the game. They vary in difficulty and style. Most are relatively easy; however, there are a few which are difficult. 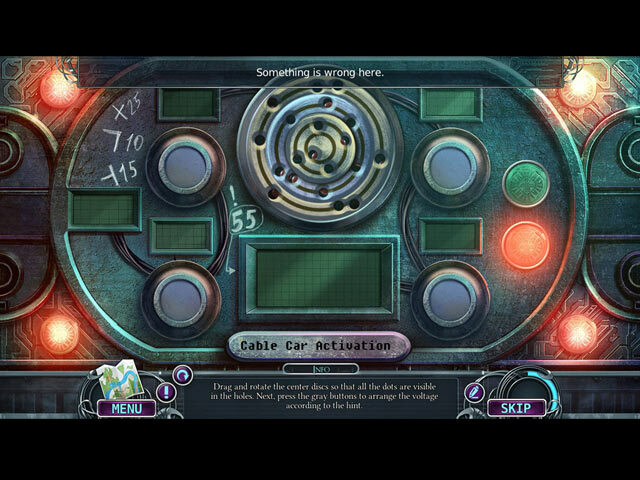 Some of the puzzles relate to the theme of this game. However, to create puzzles based on the theme of this game would be rather difficult. Unless you are an “Einstein,” it is probably better the developer DID NOT base puzzles on this branch of physics. SPOILERS: HERE ARE SOME OF MY FAVORITE PUZZLES AFTER THE DEMO: A. Assembly puzzle. Create three images by choosing between patterns which, when combined, will produce a given image. B. Kill the “itsy bitsy” spider’s polar opposite! Physical puzzle. (1) Place triangles on a square which acts as a shield before a worm tries to invade. (2) Click on a target when cross hairs enter a glowing orb. C. Through the looking glass. Assembly puzzle. Using four buttons with different geometrical shapes, recreate a “mirror” image to one given. D. Map puzzle. Follow directions and lead your car to various locations to get to your final destination. You will need to move the screen to locate the landmarks E. Queens 8 Puzzle. Ye olde chestnut in which you must place (in this case) chips on a chess board so that no row or column has more than one chip within it. F. Escape puzzle. On a grid move a detective from square-to square avoiding beams of light which rotate after each move. If you get zapped by a beam of light – you must start over. Rated 5 out of 5 by rainworm from The case of the fog monsters The good old Mystery Trackers are back, we are an agent and – for the very first time - may choose, if we want Elf at our side! So, agents, first task: choose your assistant or go ahead without him. 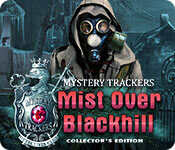 We stumble into our mysterious case on a bike ride, when we stop near the town of Blackhill, lying under a thick mist. Strange and we cannot leave that uninvestigated! In the town we see some shadowy outline in the mist and hear a voice, shouting for help. A man rushes us into his shop. He tells us, the shadows are monsters, and they started to come out of the fog after some mysterious flashes happened around the mansion of a scientist, Professor Xiao. An experiment, gone wrong at the Professor’s house? Possible, as according to the shop keeper, the Professor is a good man but his scientific work may bear some risks. No way, the monsters must be stopped, so we need to reach the scientist’s mansion over the hill to investigate the source of it all. A fast paced game, a lot to do and many variable HOS and puzzles on our way. The story may be not new but is thrilling enough. Though a look at the strategy guide reveils: the game is very short, only 3 chapters plus the bonus chapter. The extras are meagre too: no replay of HOS and puzzles. Besides the secret room, the usual incentive of collector’s editions, the bonus content offers sort of a dressing room for Elf, an Album, where you can put together collected picutures pieces, wallpapers, achievements and concept art. Rated 4 out of 5 by denniann2 from it was a shorter game for this series i was very surprised that it was over so quickly. there is a good hint system and four different levels that you can play on. it was not that hard.